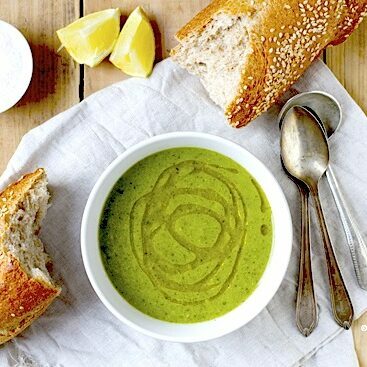 This creamy soup appeals to broccoli lovers and (supposed) broccoli haters alike and is packed with nutrition. One of my twins chows down on steamed broccoli with as much gusto as I do. The other won’t touch it with a ten foot pole. My son politely declines to partake in my steamed broccoli fests. Yet, all three kids cleaned their bowls of “monster soup” nicely. I added croutons for my son while the twins had theirs straight-up. This soup features two of my favourite “secret” ingredients: cashew cream and nutritional yeast. Nutritional yeast has a nutty, savoury taste. It is made from Saccharomyces cerevisiae, a one-celled fungus. If the word fungus freaks you out, remember that mushrooms are fungi too. Like bacteria, fungi can be good or bad for you. Learn more here about fungi. When you eat nutritional yeast,you are eating a whole organism! Given this, it’s not surprising that this food is a nutritional powerhouse. It is rich in protein (10 grams per cup) and full of many of the nutrients that vegans (and others) need to look out for: iron, selenium, zinc, magnesium, potassium, and chromium. Nutritional yeast is similar to the yeast you bake with, but they are not interchangeable. Yeast used in baking is still alive, and can produce carbon dioxide gas when you feed it sugar. Nutritional yeast is dead – but still full of nutrients! Read more here about the differences. *You can find nutritional yeast in the bulk section of most health food stores. It’s yellow and flaky. Soak the cashews in 1 cup of boiling water. Let them sit while you prepare the rest of the soup. Prep veggies: Chop broccoli into large chunks; peel and chop potato (medium chunks); Chop onions and celery (small to medium pieces); peel and smash garlic. Heat olive oil in a large saucepan over medium heat. Add the onions and a pinch of salt and cook until light brown, about 7 minutes. Add the celery, garlic and 1/4 teaspoon pepper and cook for 5 minutes. Add the potatoes, 3 cups water and 1/2 teaspoon salt, raise the heat to high and bring to a boil. Return the heat to medium, cover and cook until the potatoes are tender, about 15 minutes. Add the broccoli, cover and cook until the broccoli is bright green, about 5 minutes. Place cashews and water in blender, and puree until smooth. Either set aside to add separately to each serving, or leave cashews in blender and begin adding soup. Blend soup, either by ladling a bit at a time into blender, or with a hand-held blender. Serve warm, with salt and pepper to taste. Add cashew cream if not already added to pot. *Make your whole wheat croutons by brushing oil or margerine on bread then sprinkling garlic salt. Pop in a toaster oven for a few minutes at 350 F.
Credit. This recipe is a mashup, created and executed by our supernanny Paula. It was inspired by recipes from Food Network and Honest Cooking. Thank you all for helping to fuel broccoli lovers and haters alike!